What happens when two members of the world-class St. Louis Symphony unite with two of the regions finest jazz musicians? You get The 442s! The 442s were born of a common musical inquisitiveness and a search for new and exciting musical possibilities and collaborations. 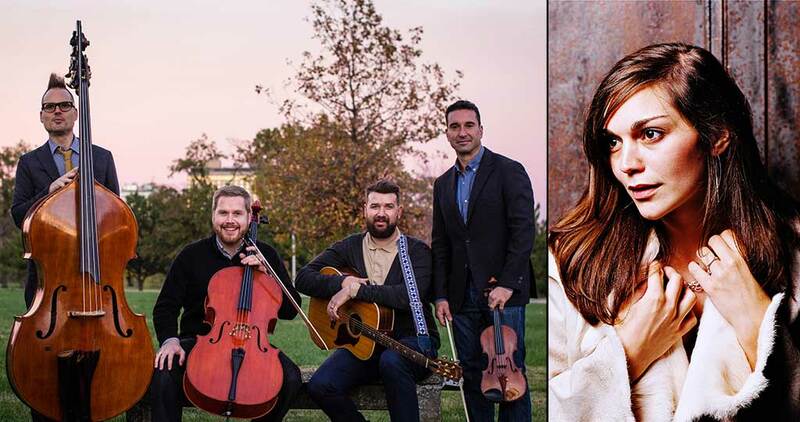 Brought together by the innovative and inspired compositions of Adam Maness, who plays piano, guitar, accordion, melodica and glockenspiel in the group, The 442s features Shawn Weil on violin, Bjorn Ranheim on cello and Syd Rodway on bass. Formed in 2012, this unique ensemble blends virtuosic musicianship, group singing and inventive improvisation, all while breaking down barriers between jazz, classical, folk and pop music. In the decade-plus since Erin Bode began her professional recording career, she has garnered much critical praise for her pure voice, perfect pitch, and impressive phrasing and style. A Minnesota native, Bode was first introduced to music by her father, a Lutheran minister, who emphasized music in daily life and encouraged her to join the church choir. She studied music as well as foreign languages at the University of Minnesota in the Twin Cities and graduated from Webster University in St. Louis. The Erin Bode Group creates music forged from the Americana of its members’ Midwestern roots, infused with jazz grooves and made magic by Bode’s bell-like voice.